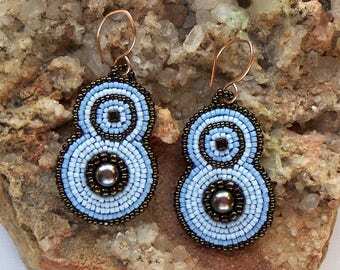 Beaded art and unusual jewelry. Announcement EASTER SALE is here: get 10% OFF YOUR PURCHASE of anything in my shop. Discount applied automatically at the check-out. Let's celebrate Spring! Welcome to my shop! I am Nata, and I enjoy bringing Beauty into this world through my hands and Heart. Sometimes a message comes through with the beads. My other "happy" is my Love for Airedale Terriers, especially the older guys. Your purchases help me support them through National Airedale Rescue, South West Airedale Terrier Rescue, and other Rescue organizations: I donate a minimum of 50% of all of my sales. Look around, browse my works, read the stories "behind the scenes", and enjoy! If you've smiled even just once, then together we've made this world a one smile better place already. Who is my jewelry for? Inside of every grown woman there lives a sweet little girl who still believes in fairies and elfins, bees and butterflies, puppies and kittens, rainbows and maybe even Unicorns. It is for that strong and powerful grown Goddess who knows Who She Is and What She Wants in Life; for the one who delights in non-conforming, who shines Her true colors brightly, and who, throughout the years, stayed in touch with that Little Girl inside, are my most unusual and cherished works. EASTER SALE is here: get 10% OFF YOUR PURCHASE of anything in my shop. Discount applied automatically at the check-out. Let's celebrate Spring! 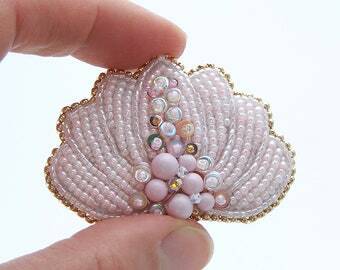 Periwinkle Angel Wings beaded earrings embroidered with Czech glass and vintage Charlotte seed beads, rose gold accents, with white leather. 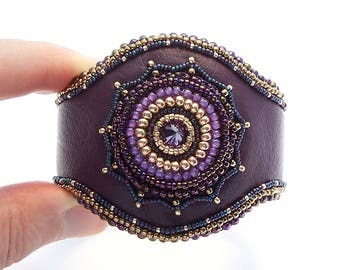 Eye of Septarian Dragon Stone dramatic wide bracelet cuff bead embroidered with Czech glass beads, Swarovski crystals, Japanese seed beads. 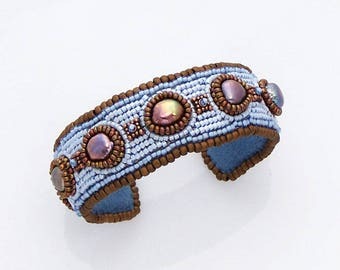 Celestial blue bracelet / cuff / bangle bead embroidered with brown baroque freshwater pearls and Japanese seed beads, fits all wrist sizes. 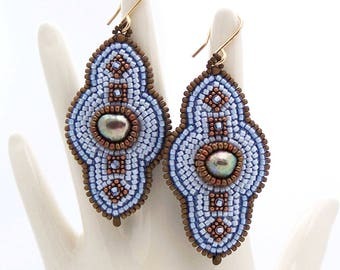 Celestial Light blue earrings bead embroidered with baroque freshwater Pearls and Japanese seed beads / ethnic feel / folk art inspired. 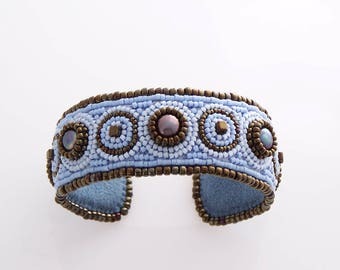 Arctic blue bracelet / cuff / bangle bead embroidered with freshwater peacock finish pearls and Japanese seed beads, fits all wrist sizes. 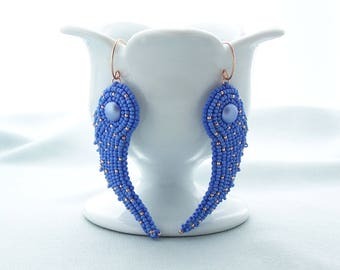 Gourd shaped Arctic Blue earrings bead embroidered with Peacock freshwater pearls and Japanese Delica seed beads / ethnic / folk inspired. 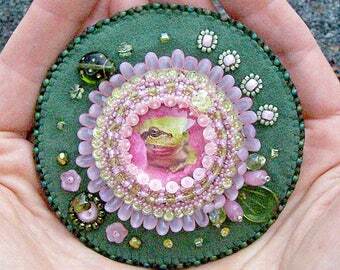 Frog Prince Nature folk tales inspired bead embroidered ornament / wedding gift / paperweight bookmark / desk office home decor / altar. 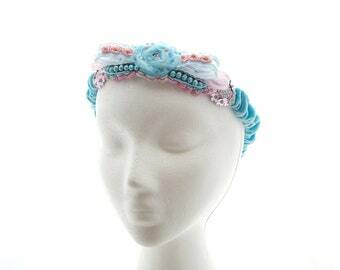 Turquoise, Baltic Amber, Amethyst and Magnesite bead embroidered soft flexible light warm brown Headband / Hairband, South Western style. 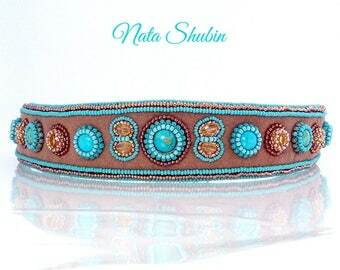 Real Turquoise and Citrine gemstones bead embroidered on light brown / dark tan Ultrasuede soft and flexible Headband / Hairband adornment. Elegant Grey / Gray soft flexible Headband / Hairband bead embroidered with Abalone shell beads, silver freshwater Pearls, and seed beads. Angel On Duty: "Eye of an Angel". 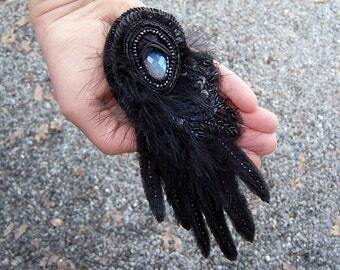 Black Angel Wing bead embroidered ornament with Labradorite for an altar / memorial place / home / wall. Angel On Duty: "Radiance". 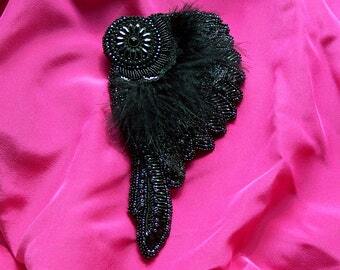 Black Angel Wing bead embroidered ornament for an altar / memorial / devotional place / home / wall decoration. 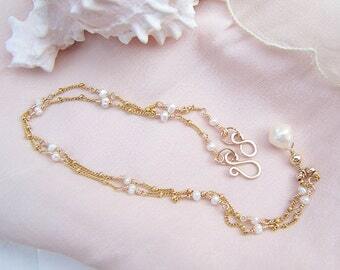 Tiny white freshwater Pearls and 14K Yellow gold filled curb chain hand wired necklace with Pearl drop pendant and an easy to handle clasp. Turquoise and 925 Sterling Silver basic sweet, very polite and well behaved hand wired chocker style necklace with a lobster claw clasp. 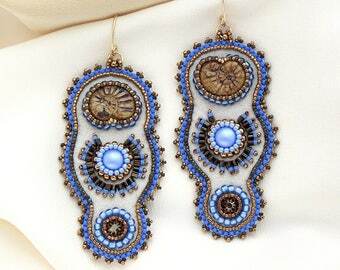 I couldn't resist these gorgeous earrings! What a talent! Exquisite workmanship and the absolute best customer service. Bead embroidered "Blue-Eyed Owlie" wall ornament, 9"x12". A fragment. 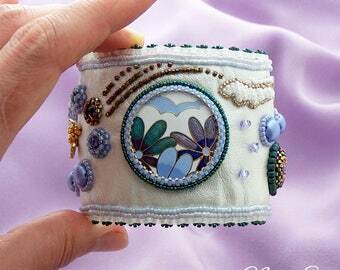 Bead embroidered "Forget-Me-Not" cuff bracelet. Crystal Feather necklace. Off-loom weaving and stringing. 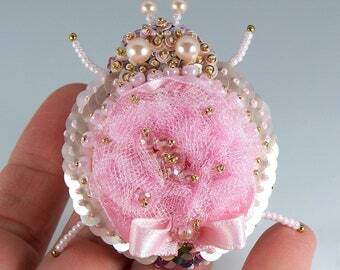 Bead embroidered "Magic Box", built just for a Fairy :). 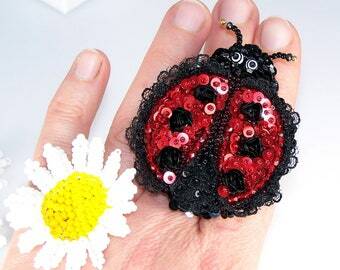 I am a freelance artisanal bead embroiderer and jewelry maker with a soft spot for all things beautiful (and fluffy). I am In Love with the Earth. I consider Mother Nature the most beautiful thing ever. I live in a small town in Sierra Foothills of Northern California. At my side is a wonderfully understanding teddy bear of a husband who supports my exuberant bead shopping escapades and patiently awaits for my re-emergence back into the world when I am working on a new piece. We are blessed to always have an Airedale in our life. My Airedale=My Muse. My works are my children. Each one is special and dear to my heart. And Yes, it matters that every piece of my work finds the most perfect forever home where it belongs. 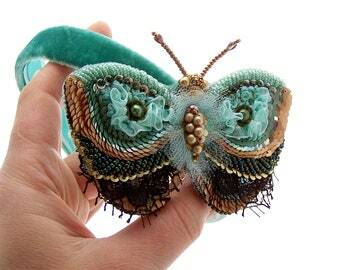 I think of my creations as jewelry for people, animals, windows, walls, altars, desks/offices, gardens (perhaps?). I use semi-precious gemstone beads and cabochons, glass and seed beads, crystals, metal components, found objects, leather and suede (both real and synthetic), wire (Sterling Silver, 14K Gold-filled (14/20GF), solid Copper). I put a tiny bit of my heart into each of my works. I create when I am moved and inspired by the Universe, often bringing in messages through my work. I don't do much marketing, really. I KNOW that if a piece came to Life through my Heart and hands, it was MEANT for someone out there, and that sooner or later that special someone will find her (or his) way to this piece. I believe stones, crystals and minerals are some of the best remedies in Mother Nature's medicine chest. I also believe that we should wear our jewelry to match our mood, not the outfit. To uplift our Spirit. I believe that we should wear our jewelry not only when we go out, but even more importantly when we are not going anywhere at all, when we are walking our dogs, digging in our gardens, running chores, reading books, cooking, napping, etc. Because we are wearing our jewelry for ourSelves, and we are with ourSelves 24/7/365, for life. And I also believe that our jewelry should rather not blend in and disappear modestly into a background of a BBB (bland, beige, boring) outfit, but be truly BBB (bright, bold, beautiful) and stand out proudly. Q. 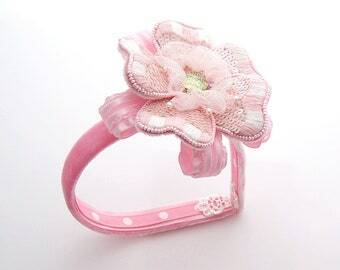 How come you don't follow the latest and fashionable trends in jewelry? I do not mass-produce. I do not have "lines" or "signature brand" of jewelry that are sold at the stores or in catalogs. The work I do is very time- and labor- consuming, and you will have hard times finding something like that sold at the store. So, why do I do it, then? I do this out of Love for Beauty and my passion for beads and gemstones. And Yes, I also enjoy exchanging my talent for money that I can support my beloved Airedale Rescue with. Quite a few of my works ended up donated to, and auctioned at various Rescue Fund Raisers. I believe this is my service to the world at this stage of my Life. Q. Can you make something special, just for me? A. Yes, I can. I do enjoy working on commission pieces and custom orders. I work with my customers close and personal, one project at a time, and I like keeping it this way, very personal. I always make sure that the client I am working with and for, gets my undivided attention. And I enjoy the follow-up, too. I do not abandon my clients, nor my work. While I can not offer an unlimited life-time guarantee on all of my pieces, I would do my best to accommodate my customers' requests for adjustments afterwards, and help with any concerns I can, to the best of my knowledge and abilities. Q. Can you whip up something in a hurry, like, over the weekend? A. Probably not. I do take my sweet time working. I only work at daylight, so that I can see true colors. And even something small and "simple" still takes about a week to carefully think and work through. Allow a couple of weeks, to be safe. And even longer for more elaborate projects. Q. Where can I see some of your past works? I am in Love with the Earth and all of Her critters, plants and minerals. Life is a Beauty, a Miracle and a Gift, and I treat it as such. Master Griffie, a.k.a. Griffon Beowulf Dog, has left his position of my Muse in July 2017, and transitioned from this Earth to the Higher Realms to become my Chief Celestial Muse, Art Guide, Teacher and Spirit Animal. Mr. JR The Airedale, Jr.
For purposes of EU data protection law, I, Nata Shubin, am the data controller of your personal information. If you have any questions or concerns, you may contact me at natabead@sonic.net. Please read descriptions carefully. Pictures are part of the description. What you see is what you will receive. Color may vary slightly depending on the settings of your viewing device. If you want to know more about an item, or see more pictures, contact me. Also, please take a moment or two (and I Thank You for that), to read my shops' policies and the FAQs section below, where I tried to address the questions you might have if you are considering purchasing from my shop. Still, not finding an answer? Just contact me. I will be happy to answer any of your questions. International shipping to certain countries is possible. Please contact me BEFORE purchasing, and I will get back to you with the quotes and available shipping methods. I do not guarantee, insure nor track shipments outside the US, therefore all international purchases are shipped at the buyers risk. Fees, custom and import taxes, VATs and other duties that may apply to international shipments at the buyer's country, are the sole responsibility of the buyer. International purchases will be declared, at their actual costs, as goods/merchandise, NOT as a "gift", on customs forms. I donate to SWAT (SouthWest Airedale Terrier Rescue) and Senior Airedale Fund of NAR (National Airedale Rescue) from EVERY sale, and when I have extra funds available, I also donate to other Rescues, individual fundraisers for Terriers and/or their humans, as well. Feel good about buying from me - your purchase supports an artist AND an older Airedale (or two) in Rescue :). We communicate over the internet. We talk about your vision. I offer you my ideas and show you photos of the materials that I have available, and you select beads and stones you want me to use in our project. Once we know what it is that we are co-creating, I give you an estimate. At this point you can easily back out of our project, no questions asked. I do not charge for the time I've already dedicated, it's all good. Alternatively, you can simply establish a budget and I will "squeeze" my work into it. Usually, when I go over the budget I assume the "over" part as my gift to my customer. I do not take down payments, unless you want me to order some special supplies for your project. Every purchase will arrive lovingly packed in an individual jewelry/gift box, some of them will be custom made by me to accommodate a particular piece, others - commercially available. 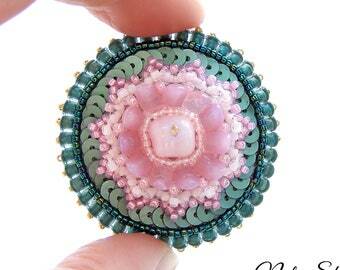 Store your bead embroidered piece in it's box and out of direct sunlight when not wearing. No special care is required. Keep it safely away from dirt, chemicals, oils, lotions, makeup, perfumes and sprays. Do not wear when swimming, bathing, using sauna or shower. Do not drop or crush. Other than that it is pretty wearable and reliable. Wire looped items in Copper and Sterling Silver will come with a complimentary piece of Sunshine polishing cloth or equivalent, enclosed with the purchase. Give your treasures an occasional rub or two to bring out the shine. Please contact me if you have any special requests regarding gift wrapping, packaging, etc. Out of respect for Mother Earth and Her resources I do re-use, wherever is possible and if in decent condition, shipping boxes and packaging materials (bubble wrap, "peanuts" and air-packs). All the materials used to present the purchased items are bright new. Rejected / unclaimed / returned parcels. It is my shop's Policy that I do not accept returns. Rejected, unclaimed, and/or returned back to me parcels will be refunded for merchandise only, provided it is still in it's original UNOPENED package. Any additional expenses incurred during and due to the return process will be deducted from the amount of a refund. 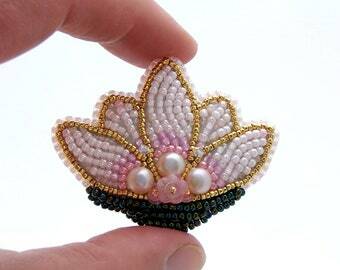 Why is bead embroidery expensive? 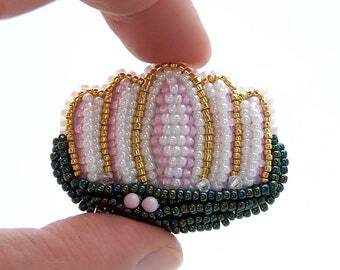 Creating a bead embroidered piece of jewelry, even the smallest one, is a lot of work. Labor-intense and time-consuming, the process consists of careful planning and thinking through the design, hours and hours (and sometimes days, and even weeks!) 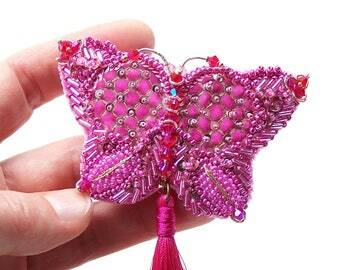 of handcrafting and meticulous stitching, bead by bead, and requires a huge deal of patience. It is truly a labor of Love, and Inspiration. Every piece turns out unique and no two are ever identical, even if you start with the same beads and design. This is a hand-made art in the fullest meaning of this word. 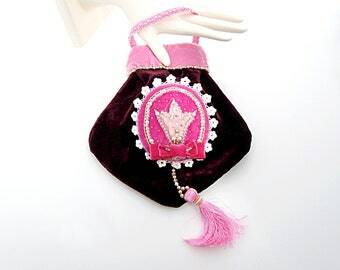 In case you've ever been wondering why is bead embroidered jewelry somewhat pricey, now you know why. Why no returns? Also, why don't you use live models in your photos? 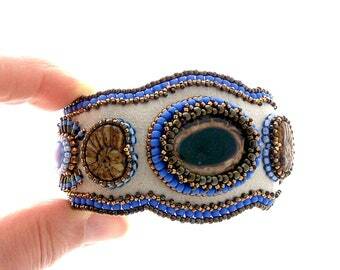 Bead embroidery is a hand stitched media finished with leather, suede, Ultrasuede or fabric (silk, velvet, lace, etc.) on the back. I take an utmost care to keep my work and work place pristine. I wash my hands often, and when I check the fit I do it over an item of clothing to avoid contact with the skin. When finished, every item is stored in it's jewelry box. If worn even just once, I consider an item "used" and that is why, for hygiene reasons, I do not accept returns, and do not use live models for photos. I do, however, use mannequin props, and, where appropriate, photos of similar items worn by my happy customers in real life. Please contact me if you have questions about sizing and fit, I'd be happy to help you figure it out.